Need some extra cash? 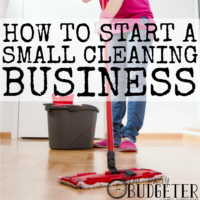 These tips will help you make money fast! Money emergencies happen. Things are going along smoothly, and then one day, the basement floods, the roof leaks, or the car needs a new transmission—and UGH! Suddenly you’re faced with a big money-eating emergency. If you have an emergency savings fund, great! At least you’re prepared for these unpleasant “surprise” expenses. They still hurt, of course, but you won’t be facing a choice like telling your husband to hitch a ride to work or not being able to pay for a pet’s veterinary bill. But, there are many of you are living paycheck to paycheck and you aren’t prepared to take a hit when something crops up. Instead, we’re stuck facing really awful choices, scary scenarios (like skipping the doctor because you can’t afford your deductible and then getting even sicker), and sleepless nights. First of all, don’t panic! You aren’t alone in this and we’re going to find a way to help you make it through! There are ways you can save and make money fast without swiping the plastic or wiping out your meager savings. One of the most important questions to ask yourself is, Is this a real emergency? I’ve said it before and I’ll say it again: there are certain things people see as urgent that are maybe…. not so dire. Things like a bridesmaid’s dress, a great deal on vacation tickets, and gifts. Yes, they’re important, but they aren’t an emergency. In many of these scenarios, the quickest, easiest way is to just say no or ask for some help and consideration. Give homemade or photo gifts, look for a bridesmaid’s dress secondhand or find something in your own closet, or skip the vacation this season and do something locally. However, if it is a real live emergency moment, then it’s time to roll up your sleeves and get creative! We’re going to find a way to make, earn and save some money fast! A few years ago (when I had our first kiddo), I was salary-less for my six-week maternity leave. This was before I was earning money from home, so the prospect of facing that much time without work was a little frightening. Fortunately, we came up with a great solution: organizing and selling stuff! It was simple and we had great results: we earned $1800 in a month and came away with a more organized, less-full house! There are many ways to earn money fast by selling items from your home. For large things like furniture, Craigslist is usually a pretty good idea. You can ask the buyer to pick the item right up, so you don’t have to worry about how to ship it, and someone local usually makes the purchase. For smaller items, like clothing, jewelry, handbags, sports memorabilia and knickknacks, you’ll have better luck with eBay. When I sold our stuff, I went around with my eBay app and just each item in and posted it right from my phone. If you’re familiar with eBay, you can make quite a bit of money pretty quickly. Another option to try is Amazon, especially if you have books you can sell. You might not earn major dollars from just a few books, but if you’ve got a bookshelf that’s overflowing, this is a great place. Other places to try: used video game stores, used sports equipment stores, and consignment shops. We’ve made quite a bit off gently used video games—and selling our old skis, rollerblades, or too-small cleats was a great option for bringing in fast cash. For big cleanouts with lots of items, consider holding a yard sale! It’s a great way to sell lots of things all at once. But, keep in mind, you won’t earn as much on individual items. Typically people shopping yard/garage sales are looking for bargains and deals. However, it can really be a great way to unload a lot of stuff at once. Another idea is to buy something to resell. This requires a bit more work, but if you have a good eye or some refurbishing skills, you can make a good amount fast. If you go to thrift stores or garage sales, watch for items of value, like brand name jeans and tops in good condition, concert and sports t-shirts, very gently used items without damage, and collectible items. Watch for toys, furniture and other fixer-uppers at garage sales and even on people’s curbs. If a coat of paint or a good wash will leave the item looking spruced up and new, pick it up and polish away! You’ll be pleasantly surprised to find you can resell many items on Craigslist, in neighborhood Facebook groups, or even on eBay. Brand name clothes and accessories, as well as anything with logos tends to sell really well on eBay and in consignment shops. 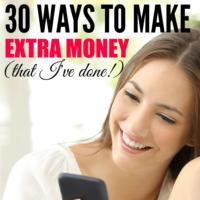 There are so many ways to quickly earn money online. You can sign up for Swagbucks here or Inbox Dollars here. In the interest of full disclosure: I don’t LOVE these two companies, but I have many readers who do. Swagbucks can bring in up to $200 a month, which can definitely help bridge the gap if you need some quick money. The option I prefer (of these three) is to sign up to be a user tester. Basically, you test websites to make sure everything’s working right. It’s really simple and easy to do and can also earn you a little online cash. 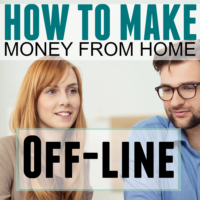 You might also want to try picking up extra jobs online by freelancing, becoming a virtual assistant, or earning money performing mini-jobs on Fiverr. You can also consider starting a blog. All of these jobs are a great opportunity to earn a little extra money and build up your savings. Unfortunately, when emergencies come up, sometimes we need cash more urgently, and some online jobs can take a while to pay off (but when they do, the payoff is big)! So, keep in mind, if you’re facing a dire situation, you might have to do something quick to make ends meet. After that, consider ways you can earn extra money online regularly to build up your savings for the future. Side jobs are great and you can end up earning money fast! A few years ago, I picked up some childcare jobs (right in my home) and was able to earn over two thousand dollars a month from having two children in my home in addition to my son. I was so happy because it allowed me to be at home with my own child, too. While you don't have time to start a home daycare, I bet you can babysit for friends and family to make a little extra money quickly. Other side job options? Consider your skillset. Are you great at making flyers, handouts and materials for other businesses? Are you crafty and able to sell your creations on Etsy? Do you have a skill you could teach at the local community center or adult education program? Could you teach an instrument or art classes to kids in your home? Maybe you love dogs—you could care for them during the day by picking up some dog-walking gigs. Ask around and post on your neighborhood boards (both virtually and in places like the local library or town hall), and see what comes your way. You might be surprised by how many people are looking for help with something you love to do or something you’re doing already! In an urgent situation (like a job layoff or big expense), you might need to take a break from spending. A spending freeze isn’t actually as bad as it sounds, and can even be approached as a “fun game” or “challenge.” (Hear me out…) See if you can go an entire month without spending any money. The best part of a spending freeze? You can usually come out with about $1000 at the end of the month! It requires a little mental preparation and you have to get over the mentality of spending nothing. 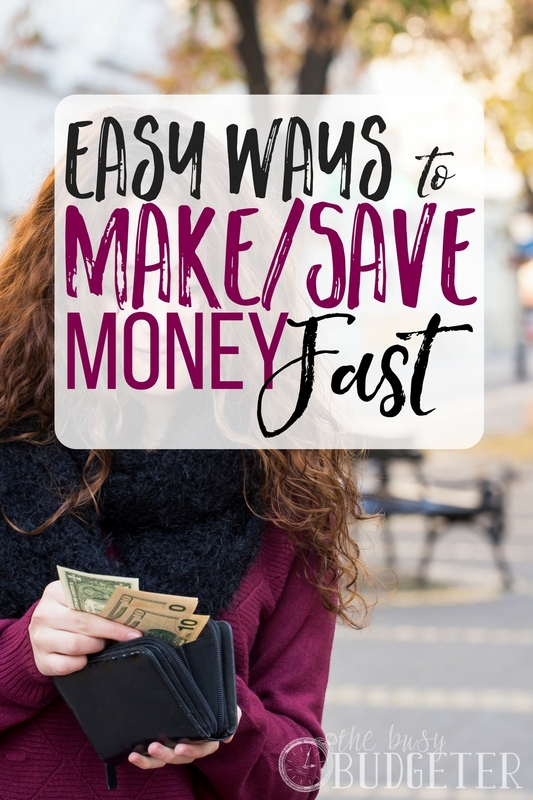 You also have to commit to the length of the freeze (some people do two weeks while others try for a month) and make yourself some guidelines about what you can and can’t spend money on. Remember, it’s all about baby steps. Set yourself up for success by making it realistic and doable. Even if you just commit to a month of eating at home, skipping coffee runs, or avoiding online shopping, you’ll probably save quite a bit more than you expect! The great thing about trying a spending freeze is you’re going to notice lots of little areas where you can save and cut back. Maybe you’ll switch out your gym membership and start using your treadmill at home. Perhaps you’ll decide you can cancel Netflix and just stick with Amazon Prime. Whatever happens, it will definitely be a learning experience and you’ll come out with some extra money. If something unusual comes up and you’re really concerned about accruing late fees on your bills and heading into a downward spiral of debt (or paying bills with credit cards), try calling your bill collectors and explaining your situation. Many medical offices, and even some creditors and lenders, will waive late fees for a one-time request or if you can schedule a future payment. If you’re facing a bill, ask if you can schedule payments or work out a cash discount. Check to see if there’s any benefit from setting up automatic withdrawal or EFT payments, or if you can get discounts for paperless billing. Often, businesses are really willing to work with you on payments as long as they know you’re doing your best and it’s going to get paid off. The most important thing that you can do when an emergency comes up is to do SOMETHING. Don’t ignore the problem hoping that it’ll go away. There are always ways you can quickly generate the cash you need and save money you can put toward your future emergency fund. What other ways have you found to earn money fast? These are awesome tips! I’ve been toying with the idea of selling things throughout the house. My problem is it’s only me and my husband for now and since we’re pretty thrifty we don’t buy a bunch of stuff that we could get rid of. I know there are things I could find though–I may have to start with the bookshelf! I really want to get started on selling items as well. I feel like no one wants to buy my “junk” haha. But I am sure all the small stuff would add up nicely. One way that I earn money on the side is by substitute teaching. I have a small advantage in that I am a former teacher turned stay-at-home mom, but as long as you have a college degree you can substitute (at least in VA!). The application is easy to fill out and there is a short orientation, but it is an easy way to earn money when you have the time (assuming you have childcare options too) as a stay-at-home mom. It’s amazing what can be done when you buckle down and set your mind to it! Skipping the lattes and cutting cable gave us another $1000 a year in the Emergency Fund. We’re working on several months of living expenses next. I agree to just do something, it’s so important! Thanks for these tips!! My hubby and I do have an emergency fund but it still hurts when we have to use it. We generally try to come up with the money without hitting our emergency fund…these are great tips for when they come! In 2016, I tripled my income from blogging. My goal in 2017 is to at least double it! It’s the best way I know how to make more money!! I love the idea of buying things to sell. I love refurbishing furniture so I think that’d be a great way to make some extra money – my only hesitation is the time that I will have to put into it. It could turn out to be a great use of your time!